Hi ya guys another week and another code this week we have the clues for the special Goldeen Pokemon. Play a game on Operation Sand Rider and press ESC but tell me how many different soundtracks there are in the game? This Clue is on the homepage of www.playtowerdefensegames.com but is the very last letter shown on the playtowerdefensegames.com homepage. Warlords 2: Rise of Demons has how many difficulty settings. In the Playtowerdefensegames logo on the homepage what letter do you seen under the word Play in the Logo..
Creepy Ranger TD is just a Halloween themed version of the famous Mushroom Revolution tower defense game. Read more details for Creepy Ranger TD. 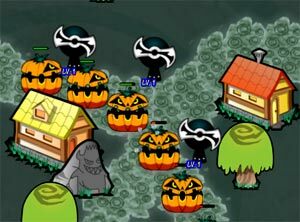 An unique Halloween theme TD game, for you to enjoy when the spooky holiday arrives! Try to get all combination to power up your Phantom! Defend your base from invasions of all kinds of scary things such as: zombies, ghosts, ghouls, goblins, witches, mummies, pumpkins and other spooky creatures! Enjoy defending! Zombie Defense Agency is a new strategy game where you need to defend your city from hordes of zombies. Read more details and watch video walkthrough for Zombie Defense Agency. Starvation amongst the Zombie population is at an all time high and they now want to go after your town. The defense agency’s job is to feed them plenty of lead! The First Hero is a new point and click adventure where you need to guide the character through mystic legends. Read more details for The First Hero. Be the chosen one, travel the ancient world and underworld to save your love. Use your mouse to point and click causing a chain of actions and reactions. Azriel: Quest for the Skyharbor is an epic war for reclaiming the magical glove. Read more details for Azriel: Quest for the Skyharbor. Find and retrieve the Skyharbor - magical glove that gives the wearer the ability to control the weather! Destroy your enemies with god-like demolishing powers such as lighting, meteors and more! Loot gold from fallen enemies to upgrade your army! Also keep in mind, enemies scale towards your play!